The news is a great place to study any language, and Japanese is no exception. For those who have an upper-beginner to intermediate level of Japanese, however, following the news or reading the newspaper may seem still far out of reach. That’s where NHK News Easy comes in! Want to keep up with current events, particularly those relevant to or frequently discussed by Japanese people, but lack the kanji knowledge or listening comprehension skills to follow the news or read the newspaper? With NHK News Easy, you can read simplified versions of news articles available from NHK’s regular news site. It is intended for foreigners and young Japanese, so furigana is displayed atop the kanji, and definitions of difficult vocabulary are displayed automatically when you hover your mouse over the word. This is a website I personally used frequently when transitioning from textbooks/educational materials to authentic materials intended for a Japanese audience. I would recommend it not only for improving your reading comprehension and vocabulary skills, but also for keeping up to date on the same topics Japanese people are following themselves – so it provides topics for conversation practice as well! ← November Cooking Event at WAHAHA! WAHAHA Students wore Kimono. They look goooood. 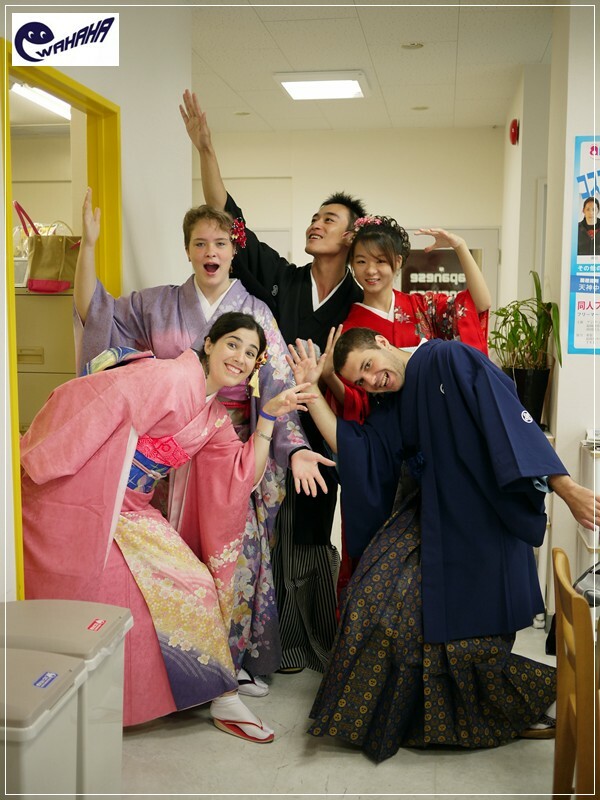 Study Japanese and See the Cherry Blossoms – Spring Courses 2018! November Cooking Event at WAHAHA! 2017 Kawabata Night Festival with WAHAHA! @WAHAHA About Japanese Course Accommodation Festival Friends Fukuoka Guest House Japanese Course Japanese Culture Japanese Food Japanese School Japanese Study Tips JLPT Preparation Course Kitakyushu Kumamoto Learn Japanese Learn Japanese in Japan Miyazaki Nagasaki NEWS Party People @ WAHAHA School Trip!? Testimonials Uncategorized WAHAHA School Party!